Most young men who love playing and watching baseball games have at least one hero whom they admire and seek to emulate. 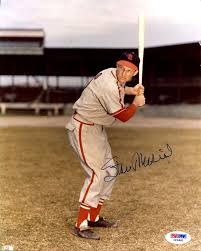 I had several heroes during my Boy’s Club baseball playing days in the early 1950’s, but my absolute favorite was Stan Musial of the St. Louis Cardinals. He was affectionately known by all as “Stan the Man”, and he lived up to his nickname in almost every category one could name. One of the reasons I so admired Stan the Man was because my beloved Aunt Tooky was also from St. Louis, and she spoke often and in glowing terms about what a good man and great baseball player he was. She did not know him personally but had several friends who did. Aunt Tooky (Thelma Manne) was my Mom’s older sister who had lived in St. Louis most of her adult life. Because she was wealthy, having been married to Uncle Max (a furniture manufacturer) for many years, she was personally familiar with many St. Louis dignitaries. She lived alone in The Chase Apartments which were exclusive and very expensive apartments adjacent to the well-known Chase Hotel. She and Uncle Max had lived separate lives for at least 10 years but had remained friends. The only explanation I was ever given concerning their marital status was, “They had trouble getting along”, and this satisfied my curiosity about her strange living arrangement. I have written 2 blog stories of the impact Aunt Tooky had on me, and how I loved being with her. (The Quality Grocery Store, Mar. 2013 and Meeting Roy Rogers, Mar. 2013). When she lived with us in El Dorado while managing The Quality Grocery Store for several months in the late 1940’s, I told her how much I admired Stan the Man and hoped one day when visiting her in St. Louis I could meet him. This planted a small seed in Aunt Tooky’s mind. I knew she loved surprising me. As my baseball playing career with the El Dorado Boy’s Club began flourishing in the early 1950’s, so my admiration for Stan the Man increased. I knew most of his playing statistics and easily quoted them with family and friends whenever conversations turned to major league baseball. This was at least 10 years before the availability of televised games, and my information was acquired through newspaper stories, occasional movie news clips and very infrequent radio broadcasts of St. Louis Cardinal games. On one family visit to St. Louis in the summer of 1948 my Uncle Harry (Aunt Tooky’s brother-in-law) had taken me to a baseball game at Sportsman’s Park. I’m sure I sat there in wonder the entire 9 innings with my mouth open, actually seeing men play whom I had only read and dreamed about. I didn’t even think about getting an autograph, because I thought it would have been impossible with so many people in the stadium. I had never been in a stadium with 45,000 people, which was double the number of people who lived in El Dorado! During the summer of 1950 I was developing into a pretty good third baseman for Gulf Refining (El Dorado Boy’s Club), but we were not at our best and missed the play-offs that year. Mom wanted to make a week-long visit to St. Louis to spend time with Aunt Tooky and Aunt Ruth, her other sister who lived in St. Louis. It was her husband, Uncle Harry who had taken me to the Cardinal game. Uncle Harry was another hero. (My Favorite Uncle Harry, Apr. 2013). I was excited to stay at Aunt Tooky’s apartment, and especially because she had a television set on which I could watch shows like Captain Kangaroo, Howdy Doody, and Art Linkletter, It was that summer while there Aunt Tooky asked, “Would you like to meet Stan Musial?” She didn’t have to hear my answer, because she said she had a friend who would set up a meeting the very next morning. I didn’t know Stan the Man owned a restaurant when she said we would drive to his restaurant and meet him in the morning because he had a game to play the next night. I doubt I slept much that night I was so excited. Aunt Tooky drove a Chrysler 2 door convertible and riding in her car was such fun, and the thrill of it only compounded the whole experience. Mom didn’t go with us so I could get the full impact of such a momentous occasion. It was just Aunt Tooky and me! She had an attorney friend named Arnold Kovin who was good buddies with Stan, and he made it all happen. Stan owned a famous restaurant named “Stan Musial and Biggie”s, and it had opened about a year prior. “Biggie” Garagnani was an experienced restaurateur who knew adding Stan Musial as a business partner would only mean greater success. Aunt Tooky knew exactly the location and drove straight there to meet him at 10 AM in front of the building. 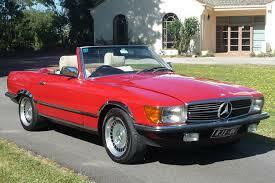 As she pulled into an empty parking spot at exactly the appointed time he was standing out front. He was dressed in a suit which was out of character for me, because I had only seen him in a Cardinal uniform as pictured above. As I stepped out of the car, he said, “You must be the young ball player from Arkansas.” while extending his hand to shake my hand. I don’t remember one thing else which was said because I was in such awe of this celebrity who acted as if he wanted to meet me! I do remember his kind and gentle manner as he looked into my eyes and handed me a new baseball in its’ own case. He said something like he was glad to meet me and thanked me for being a Cardinal fan. His parting words indicated he hoped to see me again soon. It all happened so fast the next I remember was riding back to Aunt Tooky’s apartment looking at this treasure I held. As I opened the box I beheld this new baseball inscribed, “To John Henry Best Wishes Stan Musial.” Had I been given the Hope Diamond I could have not felt more wealthy! Aunt Tooky had come through again. First Roy Rogers and now Stan Musial. In my childish amazement I considered her ability to make dreams come true was unlimited. I couldn’t wait to get back to El Dorado to show my baseball buddies what a big shot I had now become! When our 2 daughters were in their teen years I really wanted to be as involved in their lives as I possibly could. I well understood some of the stresses and anxieties of teen years, but had some difficulty in relating to teen-aged girls. 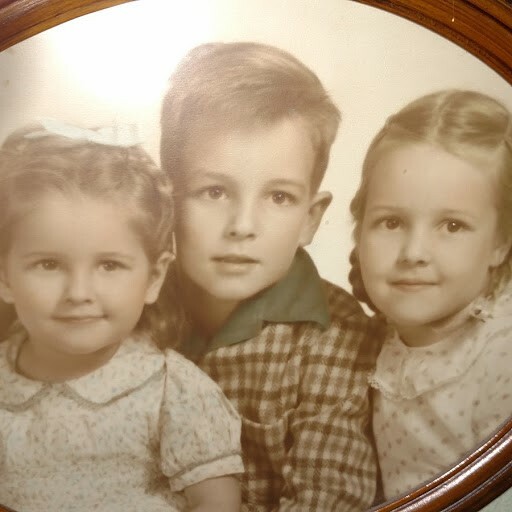 My sister Marilyn was 3 years older. and if she had any teen related problems she surely didn’t share them with me. I was pretty much clueless to the doubts, fears, insecurities, self-image anxieties, boy friend concerns, hormone changes and just plain understanding the mind of a teen-aged girl! Cathy was great in her understanding and sympathetic leadership of Mary Kay and Ginny, but she had problems transferring that wisdom to me. It was not I was a slow learner, but I thought somehow the medical knowledge I learned in medical school regarding medical and psychological problems prepared me to be a good Dad to teenagers. It didn’t. On one particular week-end I thought it would be fun to accompany Cathy, Mary Kay and Ginny on a shopping trip to Monroe, Louisiana. There was a great new shopping mall on Interstate 20 called Pecanland Mall which had opened in 1985, and it quickly became a favorite of ours. The road from El Dorado to Monroe was narrow and curvy, but the trip usually took an hour and a half whereas the trip to Little Rock always took 2+ hours. I don’t remember where John was that particular week-end but he didn’t make this trip with us. We had made the trip to Monroe many times, and I was familiar with the various curves and unevenness in the road. From Farmerville, Louisiana south towards Monroe there are some steep hills which prevent viewing oncoming traffic until they are right upon you, so I always was cautious and payed extra close attention when approaching those hills. At one particular hill a passenger car with several children riding with parents was approaching me and a single passenger car pulled into my lane to pass. I told our girls I was pulling onto the shoulder hoping there was enough room to avoid a head-on collision. At exactly that time the driver saw us and jerked his car back behind the car ahead of him causing him to start fish-tailing, just as I passed over the crest of the hill. All I saw in my rear view mirror was a cloud of dirt and rocks. 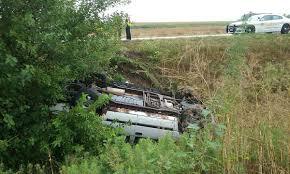 I knew he had crashed his vehicle and told our girls we were going back, so I made a quick U-turn. Fortunately there were no other vehicles on the road anywhere near us. As I came back over the hill I saw the errant driver’s car had run down into a ditch, had overturned and was smoking with the wheels still turning. Our older daughter Mary Kay screamed, “We need to get a doctor, we need to get a doctor!” Cathy turned in her seat, faced Mary Kay and said, “Your Daddy IS a doctor!” Mary Kay said, “Oh yeh.” When I pulled to a stop as far off the narrow highway as possible, our other daughter Ginny screamed, “It’s gona’ blow up, it’s gona’ blow up!” I was pretty sure that was not going to happen. The car was lying in a huge briar patch, and when I got down the hill and navigated through the briar patch, I found the driver sitting propped up against the frame of the car. He was dazed but had no obvious external wounds apart from scrapes and bruises. He was a late middle-aged Black American wearing a vested suit with a tie. I noted on the interior roof of his overturned car was a pistol, and I assumed it had been on the seat of the car when it overturned. When I asked the driver what happened he groggily said, “Somebody ran me off the road.” I told him he had better get his story straight, because his reckless driving and attempt to pass with a double yellow line in his lane caused him to run off the highway. He said he was in a hurry to attend a funeral in Ruston, Louisiana (about 40 miles away) and he was running about 30 minutes late. I told him he would be attending his own funeral the way he was driving. Within 15 minutes a local sheriff’s deputy arrived, and I was able to give him an account of the details of the accident. I had an idea there would be further investigations. About 2 weeks later I received a telephone call from a lady identifying herself as an insurance investigator. She said her client claimed he “was forced off the highway” causing extensive damage to his vehicle. I gave her the exact statement I had given to the sheriff’s deputy, and told her I would be happy to testify under oath if needed. 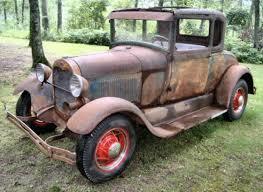 I heard nothing further concerning the wreck and assumed the preacher with the pistol was unharmed. I doubt he made it to the funeral in Ruston! Since those days as teens both our daughters have trusted my experience as a doctor and have consulted me often concerning their own health issues and those of their families. I am confident they trust my medical judgement and wisdom. In reflection on this humorous event and others I am grateful to both of them and to our son they have thought of me more as a Daddy than as a doctor, and after all that is exactly what I desired. PS: We continued on our shopping trip to Monroe and as best I remember, had a good lunch at the Red Lobster after purchasing dresses and accessories for both girls. Most of our conversation the rest of that day revolved around the dangerous, speeding, pistol packing preacher! 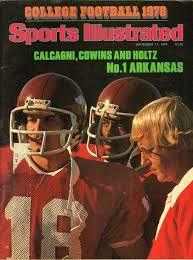 I never heard of Lou Holtz before he was hired as the head football coach of the Arkansas Razorbacks in 1976. He replaced the legendary coach Frank Broyles who had decided to retire after successfully coaching the Hogs for 19 years. Loyal Hog fans did not believe there was a coach who could even begin to match the coaching genius of Coach Broyles, much less exceed the records he had set. Coach Holtz inherited a team of excellent players whom Broyles had recruited, and they proceeded to win 11 games in his first year. Their only loss was to the #1 ranked Texas Longhorns who had All-American halfback Earl Campbell, and the score was only 13-9. For the first time the Razorbacks were invited to play in the Orange Bowl on New Year’s Day against the Oklahoma Sooners who were ranked #2 in the nation. Although Arkansas was ranked #6, it was a foregone conclusion they were greatly over-matched by a team which included several All-Americans including running back Billy Sims who won a Heisman Trophy the following year. The excitement among Hog fans was palpable until the weekend before the team was to leave for Miami when the unthinkable happened. Two of the Hog’s best players, running back Ben Cowins and receiver Donny Bobo along with an additional player Michael Forrest were involved in a dormitory incident involving a girl. Coach Holtz made a thorough investigation and decided to suspend all three players, not allowing them to travel with the team to Miami. His explanation to the players and the public for the suspensions were they had broken the “Do-Right Rule.” When asked to further explain the rule Coach Holtz simply stated, “If you want to stay out of trouble, you must obey the “Do Right Rule” which states, “Always do the right thing.” Initially many believed he had given too harsh a punishment to these players. What little chance we might have had against the mighty Sooners was seemingly erased by this verdict against our 2 best players. Many appeals were made to the coach to change his mind, but he was unmoved in his resolve and in his final decision. Cathy and I had decided to spend the latter part of our Christmas holidays with her family in Fort Lauderdale, and this would give our son John Aaron and me the opportunity to attend the Orange Bowl game along with Cathy’s brother George. During the week before Christmas, we made reservations to fly out of Monroe, Louisiana to Fort Lauderdale on Delta. During the second half of our flight itinerary from Atlanta to Fort Lauderdale I had an encounter with Rabbi Norman Goldburg which I described in the account, Sharing Jesus With Rabbi Norman; Aug. 2014. From the opening series of the game in which the Sooners fumbled and we quickly scored, it became obvious in this game on this night we were the superior team. Our running back Roland Sales gained 205 yards rushing, and this remained an Orange Bowl record for about 20 years. Our defense played extremely well and held the Sooners to 6 points while we scored 31 points. John Aaron had a “blast” with the air horn and seemingly blew it every time we made a first down. The couple sitting in front of us were obvious Sooner fans, and were so disgusted with the game and the constant air horn they left right after half time. Prior to the game many of us Razorback fans were put off by Coach Holtz’s “Do Right Rule”, but deep down were pleased with his stress on personal discipline. Those of us who initially opposed the suspension of his star players were made to understand his wisdom in maintaining strict standards. The other players understood they must take up the slack by playing harder and with greater resolve. The results were obvious and stunning, especially for those Sooner fans who were incredulous in thinking people from Arkansas were crazy to travel so far to “witness a slaughter.” As for John and me, we would have travelled twice that distance to blow the air horn for our beloved Razorbacks! After becoming a believer in the late 1970’s, Cathy and I heard many stories of great faith from The First Baptist Church of Dallas, Texas under the leadership of Dr. W.A. Criswell. We occasionally visited Dallas for various reasons, but were never in a position to attend a worship service there together. The opportunity to attend worship there opened to me in a very unusual way. In the mid 1980’s our son John Aaron and I had the opportunity to travel to Dallas with my friend, Gary Hegi and 2 sons to attend a Dallas Maverick basketball game. They were playing the Milwaukee Bucks, and our favorite former Razorback player Sidney Moncrief was the star of the Bucks. Our friend Gary Braswell who lived in Dallas obtained the tickets for us to all go together, and he brought his son with him to the game. One of the things I remember about the game was our seats were so high in the upper deck I couldn’t even make out the numbers on the player’s shirts. I had to pick out which one was Sidney by the way he was playing and the fact he was the star and scoring leader of the team. I do remember the Bucks won the game, but don’t remember anything else about the game statistics. It was just fun to all be together for this father-son outing in Dallas. our hotel reservations were at the Wyndham Hotel, and that was also a special treat because it is such a beautiful hotel with outstanding amenities. The game was over late Saturday night, and we all stayed up late into the early morning hours of Sunday. Our plan was to have a late lunch and then travel back to El Dorado in mid-afternoon. 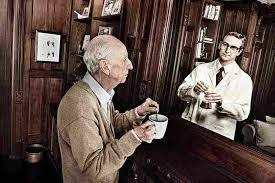 As was my usual routine I awakened by 5 AM and prepared myself some coffee in the room John Aaron and I shared. During my quiet time meditation I thought it would be fun if all of us would attend worship at First Baptist Dallas, but this had not been a part of our initial plans for our Dallas trip. I discovered there was a 10 AM worship service which would be perfect for us so we could have lunch at the usual time and still leave Dallas at our appointed time. At approximately 8 AM I began making my suggestions known to everyone, but they fell on very sleepy ears. No one wanted to go to church on this day and especially at such an early hour for them. I considered also staying at the hotel with everyone, but the more I thought about it, this would be an excellent opportunity for me to hear Dr. Criswell preach. I started getting ready, and decided it would be easier to get a taxi and be taken directly to the church without having to worry about directions, traffic and parking. I left the hotel at approximately 8:45 in order to have plenty of time to look around the church and perhaps get the chance to meet Dr. Criswell. When I arrived there was a worship service in progress so I had enough wait time to walk around the church campus in a brief and informal tour. The church was extremely impressive in its’ size and obvious place in Southern Baptist church history. I decided to sit near the back and close to an exit door so I wouldn’t get caught in a traffic jam at service end time, and then be able to quickly catch a cab back to the hotel. Dr. Criswell announced his sermon had 12 points, and he had only been able to get to 8 of them during the earlier service. He was determined during this hour to “get to all 12 points!” There were lots of “Amens” when he said that and not too many groans, so I settled in for a long but exciting sermon. About midway through his sermon I noted some unusual activity by several people in a pew to my left and about 4 rows ahead. Two people were standing and seemingly ministering to another individual. This activity continued for at least a minute when I saw the person to whom they were ministering. It was a woman who was approximately 30 years old and obviously pregnant, appearing near term. The people assisted her in standing up and with great effort helped her walk to the exit door which was right behind me. As she passed I could tell she was in distress and close to fainting, but Dr. Criswell, who I knew saw what was happening kept on preaching his 12 point sermon. As they exited the door I decided to offer my assistance, because the people with her had a confused and distraught look. As I exited the door a man who was a deacon came through the door toward me and with a wide-eyed look asked, “Are you a doctor?” When I said I was he said, “She’s about to have a baby!” They had her sitting in a chair in the foyer of that side entrance to the church and were holding her up so she wouldn’t slide out onto the floor. He was grateful to turn her care over to me since obstetrical care had not been part of his deacon orientation. I have to admit my excitement at this point thinking I am going to deliver a baby right here in the hall of First Baptist Church, even before Dr. Criswell finished the 12 points of his sermon! After I asked her a few questions and did a brief abdominal exam I determined she was in the early stages of labor in her 2nd pregnancy. 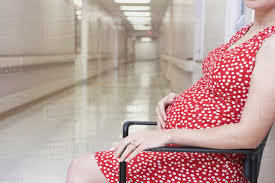 She acknowledged she believed it would be at least another hour or so before she delivered, giving us enough time to get an ambulance to the church. The ambulance was called and I remained with her to calm her until they arrived about 10 minutes later. I was relieved in one respect for the lady’s safety but disappointed to have not been part of the first delivery at First Baptist Dallas, not the sinful kind but the obstetrical. I couldn’t wait to get back to the hotel to tell the guys what they missed while they slept.